If you’re looking for the revealing of the September 2015 Mystery Chocolate Box, you’re in the right place! We’ll reveal the chocolate bars that we included in a short moment, however first, we’d like your thoughts on our new wrappers? How do you like them? Leave a comment and let us know! Now then, onto the chocolate. From the first bite, you can tell this is superb dark chocolate. What you can’t tell right away is… what is that on the bottom of the bar lending it’s slightly sweet flavor? Honestly I wish they had doubled the amount of “whatever that is”…but it certainly adds a twist. Figs! Yes, we’re talking about figs here, people. Say it: fig, fig, fig. Isn’t “fig” such a fun word to say? 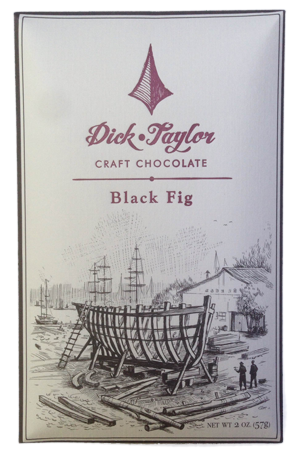 Anyway… yes, someone had the crazy idea to put figs in a chocolate bar. This means figs are no longer for reserved for snack bars (Fig Newton, anyone), which is a bit of a shock to us. We’re still getting used to figs in this brand new identity. Their stock is rising! But anyway, with all good fun poked at the fig out of the way, I’d say it worked out pretty well. It’s a delicious chocolate bar. We really hope you guessed this one right The flavor is pretty distinctive…although even then, sometimes it’s still hard to guess when you don’t know what it is. That’s why this is so much fun! This is one of those sweeter dark chocolate bars. 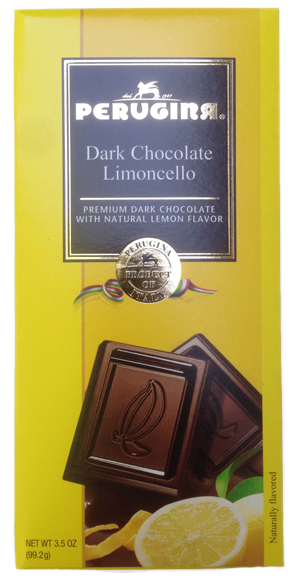 The lemon flavor is a perfect match with the dark chocolate plus the sweetness. We didn’t even make you guess “limoncello”! Even if you guessed “lemon” we still counted it as correct. 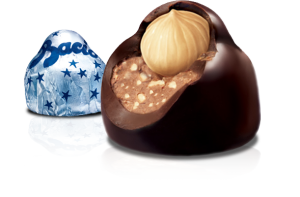 Oh, and this is the same Perugina that makes Baci candies, those chocolate “kisses” with gianduia and a single hazelnut enrobed in a layer of dark chocolate. Turns out they know their way around a chocolate bar as well! Coming from one of our favorite chocolate manufacturers, we thought this was an interesting bar. A combination of crunch, milk chocolate, and something citrusy. I will always say it, orange and chocolate is a vastly underrated combination. This bar holds true, plus it also has quinoa crisps in it that add a bit of crunch. Did you enjoy this box? Share it on your favorite social network and tag us! We’re @ChocolateBoxYum on Twitter and MysteryChocolateBox on Facebook. Or, leave a comment below and let us know! 2 Replies to "September 2015"
What a great box!!! I would love one..